Photography: Jigme Wangmo, 15, a student of Jampeling higher secondary school from Trashigang had never held a sophisticated camera before. It was the first time she fiddled with a Canon DSLR camera during the photography workshop that is being conducted in Thimphu. The weeklong workshop began yesterday. With an awkward movement of hands and flushed face, Jigme Wangmo started clicking pictures of anything she saw through the lenses. With burst of giggles she looked at the slanted pictures she took with the camera. Jigme’s colleague, Ngawang Eden, 15, of Jigme Sherubling higher secondary school from Trashigang, was going through the same experience. Tutor and organiser of the workshop, Fredric Roberts, interrupts the girls and starts explaining them how to focus with the lenses before taking a picture. Fredric Roberts is a former Wall Street investment banker and turned photographer. Six renowned photographers based in New York, California, Hong Kong and Nepal is assisting him to teach the students the basics of photography. Today, anyone who owns a smart phone or a camera is a photographer but it takes creativity and knowledge to be able to tell a story through one’s photograph, Fredric Roberts, 72, said. While another tutor, Arthur Ollman, who has been a photographer for more than 45 years, said in an imperfect democracy, photographers play an important role. “They are the ones who can show the reality of a society through their photographs and we are creating another 20 photographers who will do just that,” Arthur Ollman said. The students, through the workshop, will learn the basics of photography and will participate in story assignments covering on themes such as local products, health care, nunnery and lives of the differently abled. The tutors are volunteering their services and skills for the workshop. 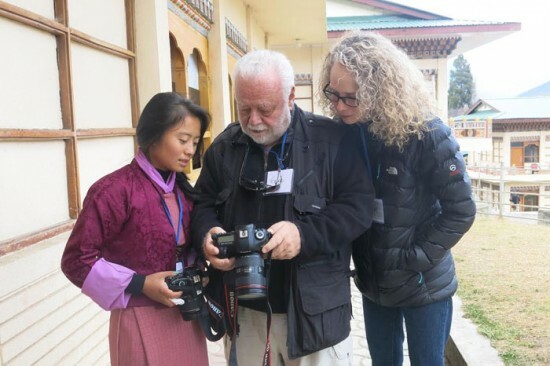 The top photos taken by the students will get a chance to exhibit their photographs at the Nehru-Wangchuck cultural centre on the last day of the workshop, Fredric Roberts said. Fredric Roberts and his team are travelling worldwide teaching youth the power of expression through photography. This is the second similar workshop they are conducting in the capital this year. About 20 students are participating in the workshop where half of the students participating are from rural areas. The workshop is being conducted in partnership with the Bhutan Centre for Media and Democracy, Bhutan Foundation and Bhutan Airlines.